From acclaimed tech writer Clive Thompson, a brilliant and immersive anthropological reckoning with the most powerful tribe in the world today, computer programmers - where they come from, how they think, what makes for greatness in their world, and what should give us pause.You use software nearly every instant you're awake. And this may sound weirdly obvious, but every single one of those pieces of software was written by a programmer. Programmers are thus among the most quietly influential people on the planet. As we live in a world made of software, they're the architects. The decisions they make guide our behavior. When they make something newly easy to do, we do a lot more of it. If they make it hard or impossible to do something, we do less of it.If we want to understand how today's world works, we ought to understand something about coders. Who exactly are the people that are building today's world? What makes them tick? What type of personality is drawn to writing software? And perhaps most interestingly -- what does it do to them?One of the first pieces of coding a newbie learns is the program to make the computer say "Hello, world!" Like that piece of code, Clive Thompson's book is a delightful place to begin to understand this vocation, which is both a profession and a way of life, and which essentially didn't exist little more than a generation ago, but now is considered just about the only safe bet we can make about what the future holds. Thompson takes us close to some of the great coders of our time, and unpacks the surprising history of the field, beginning with the first great coders, who were women. Ironically, if we're going to traffic in stereotypes, women are arguably "naturally" better at coding than men, but they were written out of the history, and shoved out of the seats, for reasons that are illuminating. Now programming is indeed, if not a pure brotopia, at least an awfully homogenous community, which attracts people from a very narrow band of backgrounds and personality types. As Thompson learns, the consequences of that are significant - not least being a fetish for disruption at scale that doesn't leave much time for pondering larger moral issues of collateral damage. At the same time, coding is a marvelous new art form that has improved the world in innumerable ways, and Thompson reckons deeply, as no one before him has, with what great coding in fact looks like, who creates it, and where they come from. To get as close to his subject has he can, he picks up the thread of his own long-abandoned coding practice, and tries his mightiest to up his game, with some surprising results.More and more, any serious engagement with the world demands an engagement with code and its consequences, and to understand code, we must understand coders. In that regard, Clive Thompson's Hello, World! is a marvelous and delightful master class. This is a brand new business trade about the coding frenzy that has been around in recent years. It is well informed and well written. What I found most attractive about it was its intelligent discussion of coding and programming as an occupational structure and not just a passing fancy of coding academies and proprietary trade schools. It also provides an intelligent history of the fields and some good commentary on some of the less desirable aspects of coding (unfriendliness to minorities and This is a brand new business trade about the coding frenzy that has been around in recent years. It is well informed and well written. What I found most attractive about it was its intelligent discussion of coding and programming as an occupational structure and not just a passing fancy of coding academies and proprietary trade schools. It also provides an intelligent history of the fields and some good commentary on some of the less desirable aspects of coding (unfriendliness to minorities and women, brogramming bad habits, pay issues, etc.). Mr. Thompson presents the good and the bad and does not seem to have too much of a particular axe to grind. This is not a specialized book on coding but it will be informative and entertaining to anyone wanting to learn about the area. An engaging read, and a neat packaging of the current topics in the mainstream discourse about technology. But, couldn't stop but get a feeling of déjà lu, as I follow the author's work on Wired, and the book seems more like a collection of opinion pieces in the same vein. Very good book. Highly recommended. Coders : The Making of a New Tribe and the Remaking of the World (2019) by Clive Thompson looks at who coders are, what they do and the culture that surrounds them. Thompson is a successful journalist who has written for various publications including Wired magazine. The book starts by looking at some coders at Facebook and their role in introducing the Facebook newsfeed and the like button. Some time is spent looking at different eras of programmers. 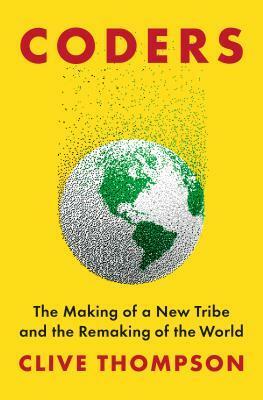 There is an excellent chapter called 'Consta Coders : The Making of a New Tribe and the Remaking of the World (2019) by Clive Thompson looks at who coders are, what they do and the culture that surrounds them. Thompson is a successful journalist who has written for various publications including Wired magazine. The book starts by looking at some coders at Facebook and their role in introducing the Facebook newsfeed and the like button. Some time is spent looking at different eras of programmers. There is an excellent chapter called 'Constant Frustration and Bursts of Joy' that captures what it's like to be a coder. Another chapter looks at Bram Cohen and his work creating BitTorrent. There is a good chapter on AI. There is also a chapter on Cypherpunks. The book ends with a chapter about teaching laid off miners coding. The chapters could stand separately. The book is essentially a collection of essays. Coders isn't a bad book and should be of interest to people interested in the culture of coding. An incredibly insightful and highly entertaining read about the people who have an impact on everyone of us in the 21st century. Very compelling and insightful text on the ins and outs of programming as a vocation. Thompson, an experienced tech journalist for Wired who started coding himself when he was a child, explores the history of computer programming and the occupational traits of programmers; the deep gender, race, class inequalities in the tech world; the rise of trolls and hackers; the presence and perils of artificial intelligence and machine learning; and the recent rise of “blue collar coders” who are challeng Very compelling and insightful text on the ins and outs of programming as a vocation. Thompson, an experienced tech journalist for Wired who started coding himself when he was a child, explores the history of computer programming and the occupational traits of programmers; the deep gender, race, class inequalities in the tech world; the rise of trolls and hackers; the presence and perils of artificial intelligence and machine learning; and the recent rise of “blue collar coders” who are challenging conventional wisdom about learning to code. “Coders” is not only a sociological observation of software engineers, but also a critique of Big Tech and the pressure that designers and engineers have to build applications seeking to collect and harvest users attention. For those who see in today’s Sillicon Valley the frat boy mentality and playground of Wall Street, Thompson delivers an unrelenting critique of the inability of men – primarily young, white, and overwhelmingly privileged – to see and correct the repercussions that their products and services are having on the world. Coders is filled with captivating anecdotes of people who have shaped the software industry, and it provides a much needed historical and human perspective. As a "coder" myself, I got more out of it than I thought I would. It's helpful to get an outsider's view on the industry to rethink some of the prevailing practices and myths (e.g., meritocracy, 10x programmers), our obsession with efficiency and scale, and unintended consequences of the software we build. Overall, the book offers an excelle Coders is filled with captivating anecdotes of people who have shaped the software industry, and it provides a much needed historical and human perspective. As a "coder" myself, I got more out of it than I thought I would. It's helpful to get an outsider's view on the industry to rethink some of the prevailing practices and myths (e.g., meritocracy, 10x programmers), our obsession with efficiency and scale, and unintended consequences of the software we build. Overall, the book offers an excellent overview of how the perception and culture of programming has changed over time, from its beginnings as a woman's job to today, when Silicon Valley geeks shape our everyday interactions and "coding" is seen as the job of the future. Ultimately, it also reminds us that getting everyone to code isn't the solution because humans are always messier than programmers expect them to be and not every problem should/can be solved with software. Coders is a wonderful book that provides a detailed history of computer science and coding while also discussing the ramifications of the growth of this "new tribe" on society. Before reading this book, the totality of my knowledge regarding coding and coders was comprised of watching "The Social Network" a few times in college and high school, yet I found coders accessible and understandable. Thompson does a great job explaining difficult coding concepts in easily digestible vernacular, while b Coders is a wonderful book that provides a detailed history of computer science and coding while also discussing the ramifications of the growth of this "new tribe" on society. Before reading this book, the totality of my knowledge regarding coding and coders was comprised of watching "The Social Network" a few times in college and high school, yet I found coders accessible and understandable. Thompson does a great job explaining difficult coding concepts in easily digestible vernacular, while being true to their meaning. Moreover, Coders is filled with a buffet of colorful characters and companies (many of which are now household names) that keep your attention from start to finish. It's hard to imagine a future in which Coders does not shoot to the top of the book charts and become a subject of discussion in reading circles across the country. Thompson takes a deep look at coders: people who write software code. He looks at who coders are, the history of coding, the act of coding, the current problems with coding and a look at where coding may be heading. As a former coder myself, I identified with the satisfaction coding brings. That made reading this book a little more impactful to me.Thompson looks at AI, machine learning, social networking and concludes that software contains the biases of the people who code it. He argues that wo Thompson takes a deep look at coders: people who write software code. He looks at who coders are, the history of coding, the act of coding, the current problems with coding and a look at where coding may be heading. As a former coder myself, I identified with the satisfaction coding brings. That made reading this book a little more impactful to me.Thompson looks at AI, machine learning, social networking and concludes that software contains the biases of the people who code it. He argues that working harder to ensure coders come from all walks of life is the best way to eliminate biases. Liberal Arts education, in some form, is a must as it teaches critical thinking. Consider that some facial recognition software cannot figure out non-white faces and this argument makes a lot sense.A thought-provoking book about something that touches all of us almost all the time. Great read on the anthropology of coder and thus the rise of the programmer culture. I was thinking that it may give me some insight into computational thinking but this was not it. I loved learning about the rise of women in technology, and the last section where we talked about blue color coders, those who has to go from blue color jobs to for profit bootcamps of coding. Reading Level: 2/5, easy to read, for senior high school kids and up.Who should read this: anyone who thinks about going int Great read on the anthropology of coder and thus the rise of the programmer culture. I was thinking that it may give me some insight into computational thinking but this was not it. I loved learning about the rise of women in technology, and the last section where we talked about blue color coders, those who has to go from blue color jobs to for profit bootcamps of coding. Reading Level: 2/5, easy to read, for senior high school kids and up.Who should read this: anyone who thinks about going into programming, or wants to know the origin of how the coder mindset started. I love reading books like this that explore how people develop technology to solve problems and have fun. Thompson also covers thorny issues like diversity and inclusion in tech and how coding is moving more deeply into our lives. This is a very light survey of an the "idea" of coders. As someone who went to a coding bootcamp and codes often, sometimes professionally, it didn't scratch the itch I had. Kinda wanna give Clive a beer for this one, top notch. Loved this book. Makes me want to pick up my old coding projects again! Pulls back the curtain on the myths, trends, and biases that shape modern tech workspaces and—ultimately—modern life, with useful insights from across the social sciences.